MegaRueda at Musica en la Plaza with Kimba Light! We Doin' it Again! One LAST time for the Year! MegaRueda at the last Musica en la Plaza in Escondido. If you were there at the beginning of September for the first Musica en la Plaza, and enjoyed dancing in the MegaRueda, we're do that again this Friday!! 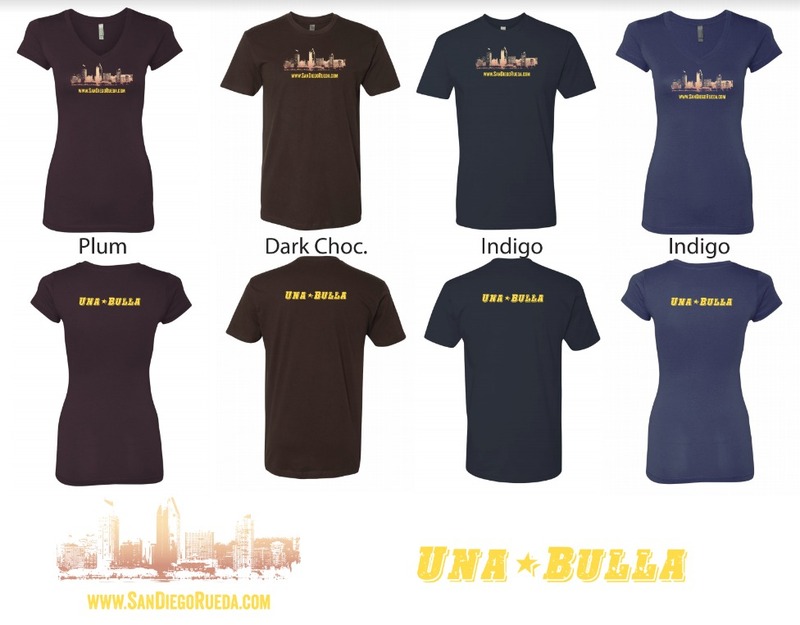 Please wear your San Deigo Rueda T-shirt to promote the blog for all Cuban dance events, dance instruction, and Cuban music in San Diego and nearby. We are having a MegaRueda Practice just before the event starts. Look for the green building on this weblink as your visual aid guide to find us. We will be there! una bulla - dos bullas, con Celia - Uy Yui Yui! 4pm-7pm Social Dancing - no lesson just a chance to meet up , catch up do some ruedas and hang out. HOW TO PREPARE: Bring beach chairs, beach blankets, we may dance barefoot since we are on the grass, so bring wipes for your feet, band-aids, and a pair of comfortable shoes, layered clothing as it will get dark and colder sooner. Bring a flashlight. 7pm will be dark, Bring your camera for pictures. This is a SNACK-LUCK, so bring something to share (food and drinks). PARKING: Give yourself some time to find parking which will be challenging. Suggest taking a Lyft or Uber to the location (drop-off point would be Seaport Village and walk over). Or, take the train to Seaport Village then walk over. We are heading outside to dance at our October's installment of Casino-on-Whatever! Yay! A new place this time! It is going to be on the grass at a new spot called Coronado Cay Park. This place is really nice. This is one of those chances to dance barefoot on the grass. HOW TO PREPARE: Family-Friendly gathering; Bring beach chairs, any kind of shade. Please bring snacks and drinks to share. Layer up as it might be hot during the day but cold as the sun goes down. Also, bring your camera for pictures. Nos Fuimos!!! 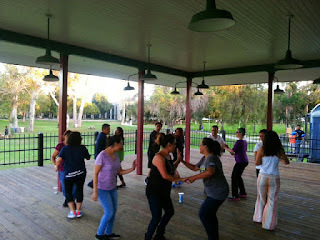 We are doing it again at Maple Street Plaza for our Friday rueda practice. Come hang out with us as we dance during the Cruisin' Grand (Classic Car show). Now that we have 2 levels going the practice is extended for two hours. Don't be late! WHAT: Meet Up for a Rueda de casino practice and social dancing; Open to all. 7:30pm-8:30pm Beginners Level 3/Intermediate practice - working on setenta, el uno, el dos, & Kentucky. Option #2: Park across from Maple Street Plaza in the Center for the Arts Parking Lot off of W. Valley Parkway (a one-way street only going west). Use this link to help you guide yourself to this parking lot. There is plenty of parking there even with Cruisin' Grand Classic Car show going on. Here we go again! Join us for another awesome night of dancing, last time was a hit and this time it will be even better! 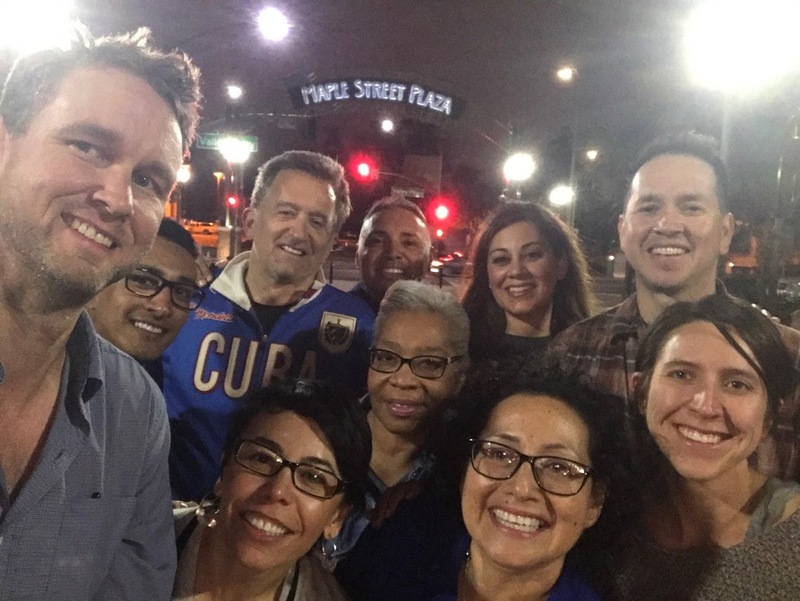 San Diego Casineros are joining forces to bring north county just what everyone has been asking for. 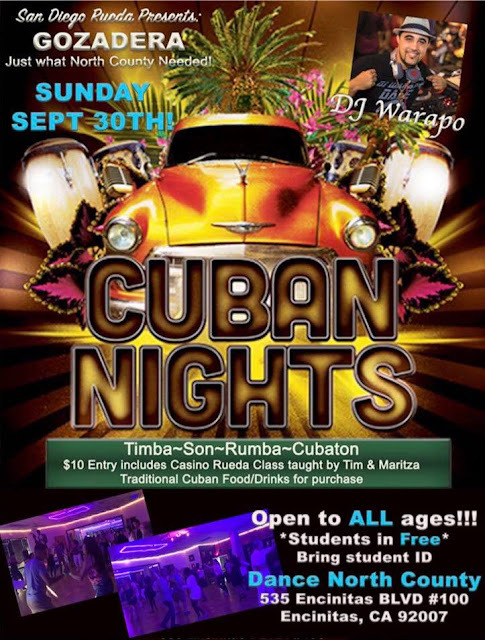 DJ Warapo from LA will be spinning the latest in Cuban music with some good ol’ classics. Warapo has DJ from Local events to all over the world including the largest festival in Cuba. He will play some hits from the latest Yasser CD which he’s producing, you do not want to miss it! Both Tim and Maritza have spent some time in Cuba training with the Santiago All-Stars as well as training with some of the best Cuban Instructors in the US. They both have had a continuous effort in keeping the Cuban Culture alive here in San Diego. You don’t want to miss their contagious energy! COST: $10 entry fee; Students get in for free before 6pm with student ID. This event is open to all ages, enjoy dancing with the whole family just like in the streets of Cuba. Enjoy authentic delicious Cuban cuisine and of course, Cuban Drinks that will be available for purchase, don’t miss a true Cuban Experience. I am starting Beginner level 3 Rueda de Casino on Tuesday, Sept 4th. Just show up on the first day. Level 3 Beginner's Series is now open and taking people. REQUIREMENTS: Dancers entering this series must already know the following moves: Pa'l Medio, Caminamos, the Tarro series of moves, Dile Que No, Guapea, Matala (series of moves), Fly (series of moves), Dame (and a few variations), Botala Pa'tras, Enchufla (and a few variations) and Echevarria, Pa'bajo, exhibela, vacilala, sombrero and vacilala variations). There are NO Drop-in's and NO make up classes for this series. 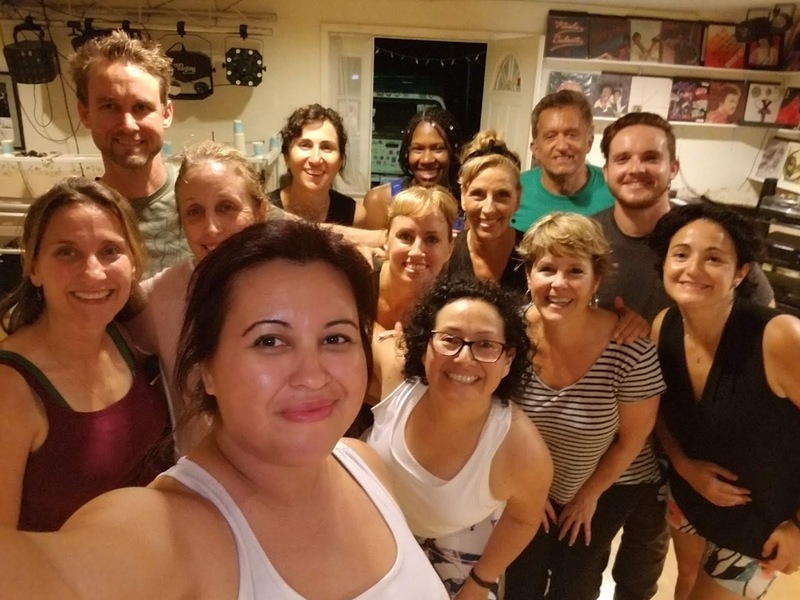 The purpose of a closed series is to raise the level of the dancer's knowledge/skill to the next level as a group. All the levels are described on this link. 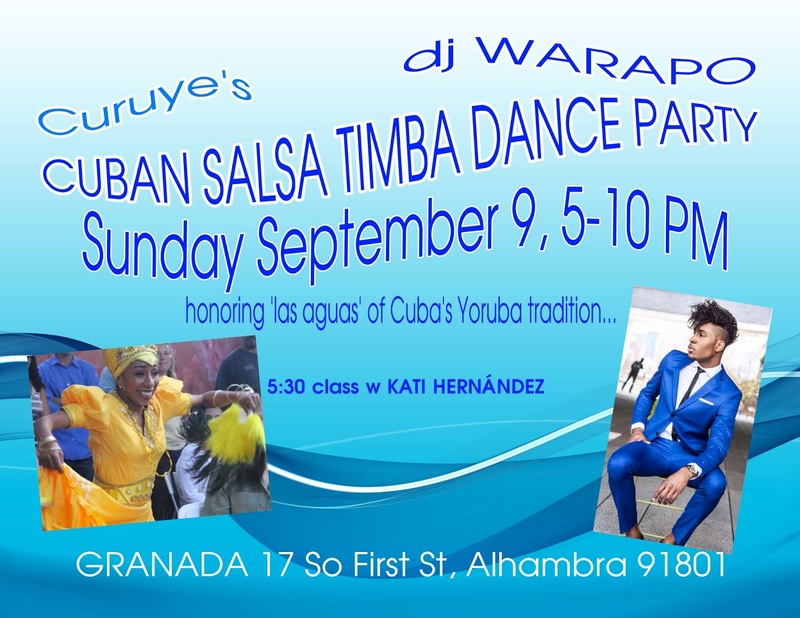 CURUYE’s CUBAN SALSA TIMBA DANCE PARTY returns SUNDAY, SEPTEMBER 9 and pays tribute to the deities of ‘las aguas’: the deity of lakes and rivers, and the deity of the ocean from Yoruba tradition celebrated this month in Cuba. Consider wearing their colors, yellow or blue! 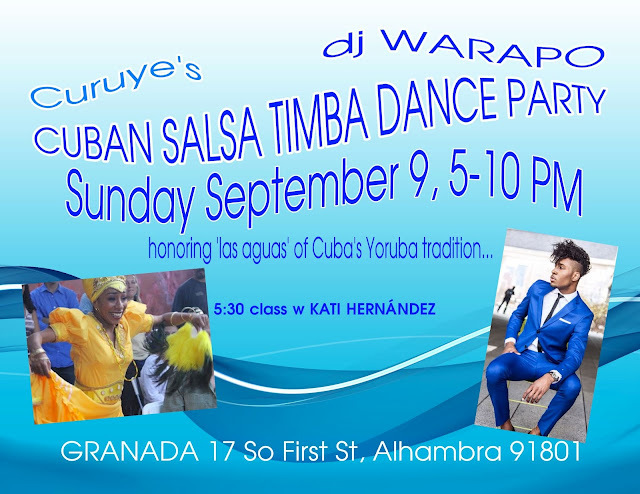 KATI HERNÁNDEZ will be teaching a fun and funky AFRO TIMBA dance class to add some Cuban spice to your freestyle dancing! Come early (5:30 pm) so you can warm up for the rest of the evening! September birthdays will be celebrated with a dance and a birthday cake! So far ALYSE KORN, ALMA ALVAREZ, and PEDRO ‘MUÑECO’ AGUILAR’s name will be on the cake! Are you a September baby? Let Curuye know if you want to be part of the celebration! Chef Israel offers a great menu for hungry dancers: everything from tasty appetizers and sandwiches, to wonderful entrées! Consider sharing a meal with your friends. $10 cover includes Kati’s dance class. Free parking in the structure across from the Granada! GET OUT YOUR DANCE SHOES, TELL A FRIEND, & JOIN IN ON THE DANCE FUN!